Lasers are distinguished from other light sources by their coherence. Spatial coherence is typically expressed through the output being a narrow beam, which is diffraction-limited. Laser beams can be focused to very tiny spots, achieving a very high irradiance, or they can have very low divergence in order to concentrate their power at a great distance. Temporal (or longitudinal) coherence implies a polarized wave at a single frequency, whose phase is correlated over a relatively great distance (the coherence length) along the beam. A beam produced by a thermal or other incoherent light source has an instantaneous amplitude and phase that vary randomly with respect to time and position, thus having a short coherence length. Lasers are characterized according to their wavelength in a vacuum. Most "single wavelength" lasers actually produce radiation in several modes with slightly different wavelengths. Although temporal coherence implies monochromaticity, there are lasers that emit a broad spectrum of light or emit different wavelengths of light simultaneously. Some lasers are not single spatial mode and have light beams that diverge more than is required by the diffraction limit. All such devices are classified as "lasers" based on their method of producing light, i.e., stimulated emission. Lasers are employed where light of the required spatial or temporal coherence can not be produced using simpler technologies. The word laser started as an acronym for "light amplification by stimulated emission of radiation". In this usage, the term "light" includes electromagnetic radiation of any frequency, not only visible light, hence the terms infrared laser, ultraviolet laser, X-ray laser and gamma-ray laser. Because the microwave predecessor of the laser, the maser, was developed first, devices of this sort operating at microwave and radio frequencies are referred to as "masers" rather than "microwave lasers" or "radio lasers". 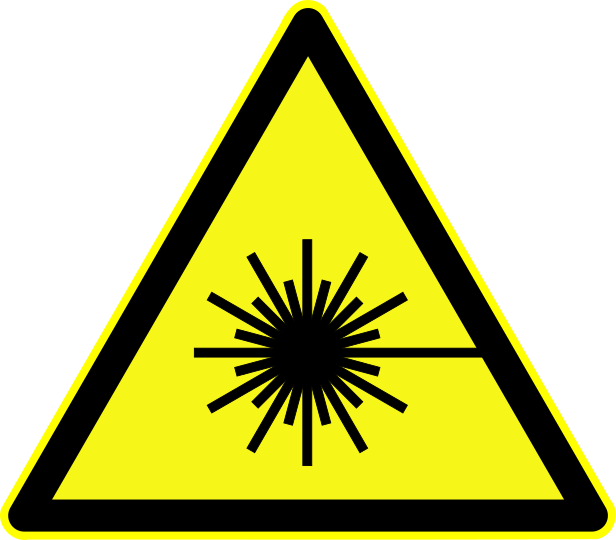 In the early technical literature, especially at Bell Telephone Laboratories, the laser was called an optical maser; this term is now obsolete. For continuous wave operation, it is required for the population inversion of the gain medium to be continually replenished by a steady pump source. In some lasing media, this is impossible. In some other lasers, it would require pumping the laser at a very high continuous power level which would be impractical or destroy the laser by producing excessive heat. Such lasers cannot be run in CW mode. In 1917, Albert Einstein established the theoretical foundations for the laser and the maser in the paper Zur Quantentheorie der Strahlung (On the Quantum Theory of Radiation) via a re-derivation of Max Planck's law of radiation, conceptually based upon probability coefficients (Einstein coefficients) for the absorption, spontaneous emission, and stimulated emission of electromagnetic radiation. In 1928, Rudolf W. Ladenburg confirmed the existence of the phenomena of stimulated emission and negative absorption. In 1939, Valentin A. Fabrikant predicted the use of stimulated emission to amplify "short" waves. In 1947, Willis E. Lamb and R.C. Retherford found apparent stimulated emission in hydrogen spectra and effected the first demonstration of stimulated emission. In 1950, Alfred Kastler (Nobel Prize for Physics 1966) proposed the method of optical pumping, experimentally confirmed, two years later, by Brossel, Kastler, and Winter. On May 16, 1960, Theodore H. Maiman operated the first functioning laser  at Hughes Research Laboratories, Malibu, California, ahead of several research teams, including those of Townes, at Columbia University, Arthur Schawlow, at Bell Labs, and Gould, at the TRG (Technical Research Group) company. Maiman's functional laser used a solid-state flashlamp-pumped synthetic ruby crystal to produce red laser light, at 694 nanometers wavelength; however, the device only was capable of pulsed operation, because of its three-level pumping design scheme. Later that year, the Iranian physicist Ali Javan, and William R. Bennett, and Donald Herriott, constructed the first gas laser, using helium and neon that was capable of continuous operation in the infrared (U.S. Patent 3,149,290); later, Javan received the Albert Einstein Award in 1993. Basov and Javan proposed the semiconductor laser diode concept. In 1962, Robert N. Hall demonstrated the first laser diode device, which was made of gallium arsenide and emitted in the near-infrared band of the spectrum at 850 nm. Later that year, Nick Holonyak, Jr. demonstrated the first semiconductor laser with a visible emission. This first semiconductor laser could only be used in pulsed-beam operation, and when cooled to liquid nitrogen temperatures (77 K). In 1970, Zhores Alferov, in the USSR, and Izuo Hayashi and Morton Panish of Bell Telephone Laboratories also independently developed room-temperature, continual-operation diode lasers, using the heterojunction structure. Excimer lasers are a special sort of gas laser powered by an electric discharge in which the lasing medium is an excimer, or more precisely an exciplex in existing designs. These are molecules which can only exist with one atom in an excited electronic state. Once the molecule transfers its excitation energy to a photon, its atoms are no longer bound to each other and the molecule disintegrates. This drastically reduces the population of the lower energy state thus greatly facilitating a population inversion. Excimers currently used are all noble gas compounds; noble gasses are chemically inert and can only form compounds while in an excited state. Excimer lasers typically operate at ultraviolet wavelengths with major applications including semiconductor photolithography and LASIK eye surgery. Commonly used excimer molecules include ArF (emission at 193 nm), KrCl (222 nm), KrF (248 nm), XeCl (308 nm), and XeF (351 nm). The molecular fluorine laser, emitting at 157 nm in the vacuum ultraviolet is sometimes referred to as an excimer laser, however this appears to be a misnomer inasmuch as F2 is a stable compound. Cameras based on charge-coupled devices may actually be more sensitive to laser damage than biological eyes. ^ "laser". Reference.com. Retrieved May 15, 2008. ^ "Four Lasers Over Paranal". www.eso.org. European Southern Observatory. Retrieved May 9, 2016. ^ "Schawlow and Townes invent the laser". Lucent Technologies. 1998. Archived from the original on October 17, 2006. Retrieved October 24, 2006. ^ "lase". Dictionary.reference.com. Retrieved December 10, 2011. ^ Siegman, Anthony E. (1986). Lasers. University Science Books. p. 2. ISBN 978-0-935702-11-8. ^ Siegman, Anthony E. (1986). Lasers. University Science Books. p. 4. ISBN 978-0-935702-11-8. ^ "Nitrogen Laser". Light and Its Uses. Scientific American. June 1974. pp. 40–43. ISBN 978-0-7167-1185-8. ^ Karman, G.P. ; McDonald, G.S. ; New, G.H.C. ; Woerdman, J.P. (November 1999). "Laser Optics: Fractal modes in unstable resonators". Nature. 402 (6758): 138. Bibcode:1999Natur.402..138K. doi:10.1038/45960. ^ a b c Mayer, B.; Regler, A.; Sterzl, S.; Stettner, T.; Koblmüller, G.; Kaniber, M.; Lingnau, B.; Lüdge, K.; Finley, J.J. (May 23, 2017). "Long-term mutual phase locking of picosecond pulse pairs generated by a semiconductor nanowire laser". Nature Communications. 8: 15521. arXiv:1603.02169. Bibcode:2017NatCo...815521M. doi:10.1038/ncomms15521. PMC 5457509. PMID 28534489. ^ Einstein, A (1917). "Zur Quantentheorie der Strahlung". Physikalische Zeitschrift. 18: 121–128. Bibcode:1917PhyZ...18..121E. ^ a b Steen, W.M. "Laser Materials Processing", 2nd Ed. 1998. ^ Batani, Dimitri (2004). "Il rischio da laser: cosa è e come affrontarlo; analisi di un problema non così lontano da noi" [The risk from laser: what it is and what it is like facing it; analysis of a problem which is thus not far away from us]. wwwold.unimib.it. Programma Corso di Formazione Obbligatorio (in Italian). University of Milano-Bicocca. p. 12. Archived from the original (Powerpoint presentation) on June 14, 2007. Retrieved January 1, 2007. ^ The Nobel Prize in Physics 1966 Presentation Speech by Professor Ivar Waller. Retrieved January 1, 2007. ^ "American Institute of Physics Oral History Interview with Joseph Weber". May 4, 2015. ^ Townes, Charles H. (1999). How the Laser Happened: Adventures of a Scientist, Oxford University Press, ISBN 978-0-19-512268-8, pp. 69–70. ^ Maiman, T. H. (1960). "Stimulated optical radiation in ruby". Nature. 187 (4736): 493–494. Bibcode:1960Natur.187..493M. doi:10.1038/187493a0. ^ Townes, Charles Hard. "The first laser". University of Chicago. Retrieved May 15, 2008. ^ "Researchers demonstrate new type of laser". Phys.org. Retrieved March 4, 2017. ^ Cassidy, M. C.; Bruno, A.; Rubbert, S.; Irfan, M.; Kammhuber, J.; Schouten, R.N. ; Akhmerov, A.R. ; Kouwenhoven, L.P. (March 2, 2017). "Demonstration of an ac Josephson junction laser". Science. 355 (6328): 939–942. arXiv:1703.05404. Bibcode:2017Sci...355..939C. doi:10.1126/science.aah6640. PMID 28254938. Retrieved March 4, 2017. ^ "ZMP 2017 – Latenzzeitmesseinrichtung für moderne elektronische Zähler". June 20, 2017. ^ Matei, D.G. ; Legero, T.; Häfner, S.; et al. (June 30, 2017). "1.5 μm Lasers with Sub-10 mHz Linewidth". Phys. Rev. Lett. 118 (26): 263202. arXiv:1702.04669. Bibcode:2017PhRvL.118z3202M. doi:10.1103/PhysRevLett.118.263202. PMID 28707932. ^ Nolen, Jim; Derek Verno. "The Carbon Dioxide Laser". Davidson Physics. Retrieved August 17, 2014. ^ Csele, Mark (2004). "The TEA Nitrogen Gas Laser". Homebuilt Lasers Page. Archived from the original on September 11, 2007. Retrieved September 15, 2007. ^ "Deep UV Lasers" (PDF). Photon Systems, Covina, Calif. Archived from the original (PDF) on July 1, 2007. Retrieved May 27, 2007. ^ Schuocker, D. (1998). Handbook of the Eurolaser Academy. Springer. ISBN 978-0-412-81910-0. ^ Bass, Michael; DeCusatis, Casimer; Enoch, Jay; Lakshminarayanan, Vasudevan; Li, Guifang; MacDonald, Carolyn; Mahajan, Virendra; Stryland, Eric Van (November 13, 2009). Handbook of Optics, Third Edition Volume V: Atmospheric Optics, Modulators, Fiber Optics, X-Ray and Neutron Optics. McGraw Hill Professional. ISBN 978-0-07-163314-7. ^ C. Stewen, M. Larionov, and A. Giesen, "Yb:YAG thin disk laser with 1 kW output power", in OSA Trends in Optics and Photonics, Advanced Solid-State Lasers, H. Injeyan, U. Keller, and C. Marshall, ed. (Optical Society of America, Washington, D.C., 2000) pp. 35–41. ^ Wu, X.; et al. (October 25, 2004). "Ultraviolet photonic crystal laser". Applied Physics Letters. 85 (17): 3657. arXiv:physics/0406005. Bibcode:2004ApPhL..85.3657W. doi:10.1063/1.1808888. ^ "Laser Diode Market". Hanel Photonics. Retrieved September 26, 2014. ^ "High-power direct-diode lasers for cutting and welding". www.industrial-lasers.com. Retrieved August 11, 2018. ^ "Green Laser". osram-os.com. August 19, 2015. ^ "Picolight ships first 4-Gbit/s 1310-nm VCSEL transceivers". Laser Focus World Online. December 9, 2005. Archived from the original on March 13, 2006. Retrieved May 27, 2006. ^ Mayer, B.; Janker, L.; Loitsch, B.; Treu, J.; Kostenbader, T.; Lichtmannecker, S.; Reichert, T.; Morkötter, S.; Kaniber, M.; Abstreiter, G.; Gies, C.; Koblmüller, G.; Finley, J.J. (January 13, 2016). "Monolithically Integrated High-β Nanowire Lasers on Silicon". Nano Letters. 16 (1): 152–156. Bibcode:2016NanoL..16..152M. doi:10.1021/acs.nanolett.5b03404. PMID 26618638. ^ Javan, A. (2000). "On knowing Marlan". Ode to a quantum physicist: A festschrift in honor of Marlan O. Scully. Elsevier. ^ F. J. Duarte, Tunable Laser Optics, 2nd Edition (CRC, New York, 2015). ^ Baldwin, G.C. ; Solem, J.C.; Gol'danskii, V. I. (1981). "Approaches to the development of gamma-ray lasers". Reviews of Modern Physics. 53 (4): 687–744. Bibcode:1981RvMP...53..687B. doi:10.1103/RevModPhys.53.687. ^ Baldwin, G.C. ; Solem, J.C. (1995). "Recent proposals for gamma-ray lasers". Laser Physics. 5 (2): 231–239. ^ Baldwin, G.C. ; Solem, J.C. (1997). "Recoilless gamma-ray lasers". Reviews of Modern Physics. 69 (4): 1085–1117. Bibcode:1997RvMP...69.1085B. doi:10.1103/RevModPhys.69.1085. ^ Baldwin, G.C. ; Solem, J.C. (1982). "Is the time ripe? Or must we wait so long for breakthroughs?". Laser Focus. 18 (6): 6&8. ^ Solem, J.C. (1979). "On the feasibility of an impulsively driven gamma-ray laser". Los Alamos Scientific Laboratory Report LA-7898. OSTI 6010532. ^ Baldwin, G.C. ; Solem, J.C. (1979). "Maximum density and capture rates of neutrons moderated from a pulsed source". Nuclear Science & Engineering. 72 (3): 281–289. doi:10.13182/NSE79-A20384. ^ Baldwin, G.C. ; Solem, J.C. (1980). "Two-stage pumping of three-level Mössbauer gamma-ray lasers". Journal of Applied Physics. 51 (5): 2372–2380. Bibcode:1980JAP....51.2372B. doi:10.1063/1.328007. ^ Solem, J.C. (1986). "Interlevel transfer mechanisms and their application to grasers". Proceedings of Advances in Laser Science-I, First International Laser Science Conference, Dallas, TX 1985 (American Institute of Physics, Optical Science and Engineering, Series 6). 146: 22–25. doi:10.1063/1.35861. ^ Biedenharn, L.C. ; Boyer, K.; Solem, J.C. (1986). "Possibility of grasing by laser-driven nuclear excitation". Proceedings of AIP Advances in Laser Science-I, Dallas, TX, November 18–22, 1985. 146: 50–51. doi:10.1063/1.35928. ^ Rinker, G. A.; Solem, J. C.; Biedenharn, L. C. (1988). "Calculation of harmonic radiation and nuclear coupling arising from atoms in strong laser fields". Proceedings of SPIE 0875, Short and Ultrashort Wavelength Lasers, los Angeles, CA, January 11, 1988 (International Society for Optics and Photonics). 146: 92–101. ^ Rinker, G. A.; Solem, J.C.; Biedenharn, L.C. (1987). "Nuclear interlevel transfer driven by collective outer shell electron excitations". Proceedings of the Second International Laser Science Conference, Seattle, WA (Advances in Laser Science-II) Lapp, M.; Stwalley, W.C.; Kenney-Wallace G.A., Eds. (American Institute of Physics, New York). 160: 75–86. OCLC 16971600. ^ Solem, J.C. (1988). "Theorem relating spatial and temporal harmonics for nuclear interlevel transfer driven by collective electronic oscillation". Journal of Quantitative Spectroscopy and Radiative Transfer. 40 (6): 713–715. Bibcode:1988JQSRT..40..713S. doi:10.1016/0022-4073(88)90067-2. ^ Solem, J.C.; Biedenharn, L.C. (1987). "Primer on coupling collective electronic oscillations to nuclei" (PDF). Los Alamos National Laboratory Report LA-10878. ^ Solem, J.C.; Biedenharn, L.C. (1988). "Laser coupling to nuclei via collective electronic oscillations: A simple heuristic model study". Journal of Quantitative Spectroscopy and Radiative Transfer. 40 (6): 707–712. Bibcode:1988JQSRT..40..707S. doi:10.1016/0022-4073(88)90066-0. ^ Boyer, K.; Java, H.; Luk, T.S. ; McIntyre, I.A. ; McPherson, A.; Rosman, R.; Solem, J.C.; Rhodes, C.K. ; Szöke, A. (1987). "Discussion of the role of many-electron motions in multiphoton ionization and excitation". Proceedings of International Conference on Multiphoton Processes (ICOMP) IV, July 13–17, 1987, Boulder, CA, Smith, S.; Knight, P.; Eds. (Cambridge University Press, Cambridge, England): 58. OSTI 10147730. ^ Biedenharn, L.C. ; Rinker, G.A. ; Solem, J.C. (1989). "A solvable approximate model for the response of atoms subjected to strong oscillatory electric fields". Journal of the Optical Society of America B. 6 (2): 221–227. Bibcode:1989JOSAB...6..221B. doi:10.1364/JOSAB.6.000221. ^ a b Fildes, Jonathan (September 12, 2007). "Mirror particles form new matter". BBC News. Retrieved May 22, 2008. ^ Hecht, Jeff (May 2008). "The history of the x-ray laser". Optics and Photonics News. 19 (5): 26–33. Bibcode:2008OptPN..19R..26H. doi:10.1364/opn.19.5.000026. ^ Robinson, Clarence A. (1981). "Advance made on high-energy laser". Aviation Week & Space Technology (February 23, 1981): 25–27. ^ Palmer, Jason (June 13, 2011). "Laser is produced by a living cell". BBC News. Retrieved June 13, 2011. ^ Malte C. Gather & Seok Hyun Yun (June 12, 2011). "Single-cell biological lasers". Nature Photonics. 5 (7): 406–410. Bibcode:2011NaPho...5..406G. doi:10.1038/nphoton.2011.99. Retrieved June 13, 2011. ^ Charles H. Townes (2003). "The first laser". In Laura Garwin; Tim Lincoln (eds.). A Century of Nature: Twenty-One Discoveries that Changed Science and the World. University of Chicago Press. pp. 107–12. ISBN 978-0-226-28413-2. ^ Kincade, Kathy; Anderson, Stephen (January 1, 2005). "Laser Marketplace 2005: Consumer applications boost laser sales 10%". Laser Focus World. Vol. 41 no. 1. ^ Steele, Robert V. (February 1, 2005). "Diode-laser market grows at a slower rate". Laser Focus World. Vol. 41 no. 2. ^ "Laser therapy for cancer: MedlinePlus Medical Encyclopedia". medlineplus.gov. Retrieved December 15, 2017. ^ "Lasers in Cancer Treatment". National Institutes of Health, National Cancer Institute. September 13, 2011. Retrieved December 15, 2017. This article incorporates text from this source, which is in the public domain. ^ "Police fight back on laser threat". BBC News. April 8, 2009. Retrieved April 4, 2010. ^ Peter, Pae (March 19, 2009). "Northrop Advance Brings Era Of The Laser Gun Closer". Los Angeles Times. p. B2. ^ "Missile Defense Umbrella?". Center for Strategic and International Studies. Archived from the original on January 11, 2011. ^ "Schwartz: Get those AF boots off the ground". airforcetimes.com. ^ Hodge, Nathan (February 11, 2011). "Pentagon Loses War To Zap Airborne Laser From Budget". Wall Street Journal. ^ Butler, Amy (December 21, 2011). "Lights Out For The Airborne Laser". Aviation Week. ^ Luis Martinez (April 9, 2013). "Navy's New Laser Weapon Blasts Bad Guys From Air, Sea". ABC. Retrieved April 9, 2013. ^ PowerLabs CO2 LASER! Sam Barros June 21, 2006. Retrieved January 1, 2007. ^ Maks, Stephanie. "Howto: Make a DVD burner into a high-powered laser". Transmissions from Planet Stephanie. Retrieved April 6, 2015. ^ "Green Laser 400 mW burn a box CD in 4 second". YouTube. Retrieved December 10, 2011. ^ "Laser Diode Power Output Based on DVD-R/RW specs". elabz.com. Retrieved December 10, 2011. ^ Peavy, George M. (January 23, 2014). "How to select a surgical veterinary laser". Aesculight. Retrieved March 30, 2016. ^ Heller, Arnie, "Orchestrating the world's most powerful laser." Science and Technology Review. Lawrence Livermore National Laboratory, July/August 2005. URL accessed May 27, 2006. ^ Schewe, Phillip F.; Stein, Ben (November 9, 1998). "Physics News Update 401". American Institute of Physics. Archived from the original on June 14, 2008. Retrieved March 15, 2008. ^ Hecht, Jeff (January 24, 2018). "Can Lidars Zap Camera Chips?". IEEE Spectrum. Retrieved February 1, 2019. Taylor, Nick (2000). LASER: The inventor, the Nobel laureate, and the thirty-year patent war. New York: Simon & Schuster. ISBN 978-0-684-83515-0. Confocal microscopy, most frequently confocal laser scanning microscopy (CLSM) or laser confocal scanning microscopy (LCSM), is an optical imaging technique for increasing optical resolution and contrast of a micrograph by means of using a spatial pinhole to block out-of-focus light in image formation. Capturing multiple two-dimensional images at different depths in a sample enables the reconstruction of three-dimensional structures (a process known as optical sectioning) within an object. This technique is used extensively in the scientific and industrial communities and typical applications are in life sciences, semiconductor inspection and materials science. Light travels through the sample under a conventional microscope as far into the specimen as it can penetrate, while a confocal microscope only focuses a smaller beam of light at one narrow depth level at a time. The CLSM achieves a controlled and highly limited depth of focus. A directed-energy weapon (DEW) is a ranged weapon that damages its target with highly focused energy, including laser, microwaves and particle beams. Potential applications of this technology include weapons that target personnel, missiles, vehicles, and optical devices.In the United States, the Pentagon, DARPA, the Air Force Research Laboratory, United States Army Armament Research Development and Engineering Center, and the Naval Research Laboratory are researching directed-energy weapons and railguns to counter ballistic missiles, hypersonic cruise missiles, and hypersonic glide vehicles. These systems of missile defense are expected to come online no sooner than the mid to late-2020s.Russia, China, India, and the United Kingdom are also developing directed-energy weapons. Glaucoma is a group of eye diseases which result in damage to the optic nerve and cause vision loss. The most common type is open-angle glaucoma with less common types including closed-angle glaucoma and normal-tension glaucoma. Open-angle glaucoma develops slowly over time and there is no pain. Peripheral vision may begin to decrease followed by central vision resulting in blindness if not treated. Closed-angle glaucoma can present gradually or suddenly. The sudden presentation may involve severe eye pain, blurred vision, mid-dilated pupil, redness of the eye, and nausea. Vision loss from glaucoma, once it has occurred, is permanent.Risk factors for glaucoma include increased pressure in the eye, a family history of the condition, and high blood pressure. For eye pressures a value of greater than 21 mmHg or 2.8 kPa is often used with higher pressures leading to a greater risk. However, some may have high eye pressure for years and never develop damage. Conversely, optic nerve damage may occur with normal pressure, known as normal-tension glaucoma. The mechanism of open-angle glaucoma is believed to be slow exit of aqueous humor through the trabecular meshwork while in closed-angle glaucoma the iris blocks the trabecular meshwork. Diagnosis is by a dilated eye examination. Often the optic nerve shows an abnormal amount of cupping.If treated early it is possible to slow or stop the progression of disease with medication, laser treatment, or surgery. The goal of these treatments is to decrease eye pressure. A number of different classes of glaucoma medication are available. Laser treatments may be effective in both open-angle and closed-angle glaucoma. A number of types of glaucoma surgeries may be used in people who do not respond sufficiently to other measures. Treatment of closed-angle glaucoma is a medical emergency.About 6 to 67 million people have glaucoma globally. The disease affects about 2 million people in the United States. It occurs more commonly among older people. Closed-angle glaucoma is more common in women. Glaucoma has been called the "silent thief of sight" because the loss of vision usually occurs slowly over a long period of time. Worldwide, glaucoma is the second-leading cause of blindness after cataracts. The word "glaucoma" is from Ancient Greek glaukos which means blue, green, or gray. In English, the word was used as early as 1587 but did not become commonly used until after 1850, when the development of the ophthalmoscope allowed people to see the optic nerve damage. LASIK or Lasik (laser-assisted in situ keratomileusis), commonly referred to as laser eye surgery or laser vision correction, is a type of refractive surgery for the correction of myopia, hyperopia, and astigmatism. The LASIK surgery is performed by an ophthalmologist who uses a laser or microkeratome to reshape the eye's cornea in order to improve visual acuity. For most people, LASIK provides a long-lasting alternative to eyeglasses or contact lenses. LASIK is most similar to another surgical corrective procedure, photorefractive keratectomy (PRK), and LASEK. All represent advances over radial keratotomy in the surgical treatment of refractive errors of vision. For patients with moderate to high myopia or thin corneas which cannot be treated with LASIK and PRK, the phakic intraocular lens is an alternative. As of 2018, roughly 8 million Americans have had LASIK and, as of 2016, more than 40 million procedures have been performed since 1991. However, the procedure seems to be a declining option for many in the United States, dropping more than 50 percent, from about 1.5 million surgeries in 2007 to 604,000 in 2015, according to the eye care data source Market Scope. A study in the journal, Cornea, determined the frequency with which LASIK was searched on Google from 2007 to 2011. Within this time frame, LASIK searches declined by 40% in the United States. Countries such as the U.K. and India also showed a decline, 22% and 24% respectively. Canada, however, showed an increase in LASIK searches by 8%. By 2015 in the US, LASIK declined by 50%. This decrease in interest can be attributed to a few things: the emergence of refractive cataract surgery, the economic recession in 2008, and unfavorable media coverage from the FDA’s 2008 press release on LASIK. Although the format was capable of offering higher-quality video and audio than its consumer rivals, VHS and Betamax videotape, LaserDisc never managed to gain widespread use in North America, largely due to high costs for the players and video titles themselves and the inability to record TV programs, though it eventually did gain some traction in that region to become somewhat popular in the 1990s. It was not a popular format in Europe and Australasia.By contrast, the format was much more popular in Japan and in the more affluent regions of Southeast Asia, such as Hong Kong, Singapore and Malaysia, and was the prevalent rental video medium in Hong Kong during the 1990s. Its superior video and audio quality made it a popular choice among videophiles and film enthusiasts during its lifespan. The technologies and concepts behind LaserDisc were the foundation for later optical disc formats including Compact Disc (CD), DVD and Blu-ray (BD). The International Laser Class sailboat, also called Laser Standard and the Laser One is a popular one-design class of small sailing dinghy. According to the Laser Class Rules the boat may be sailed by either one or two people, though it is rarely sailed by two. The design, by Bruce Kirby, emphasizes simplicity and performance. The dinghy is manufactured by independent companies in different parts of the world, including LaserPerformance (Americas, Europe, Asia, and Middle East), Performance Sailcraft Australia (Oceania) and Performance Sailcraft Japan. The Laser is one of the most popular single-handed dinghies in the world. As of 2018, there are more than 215,000 boats worldwide. A commonly cited reason for its popularity is that it is robust and simple to rig and sail in addition to its durability; it's also very fast. The Laser also provides very competitive racing due to the very tight class association controls which eliminate differences in hull, sails and equipment. The term "Laser" is often used to refer to the Laser Standard (the largest of the sail plan rigs available for the Laser hull). However, there are two other sail plan rigs available for the Laser Standard hull and a series of other "Laser"-branded boats which are of completely different hull designs. Examples include the Laser 2 and Laser Pico. The Laser Standard, Laser Radial and Laser 4.7 are three types of 'Laser' administered by the International Laser Class Association. The laser's hull is made out of GRP, Glass Reinforced Plastics. The deck has a foam layer underneath for strength. Laser diodes can directly convert electrical energy into light. Driven by voltage, the doped p-n-transition allows for recombination of an electron with a hole. Due to the drop of the electron from a higher energy level to a lower one, radiation, in the form of an emitted photon is generated. This is spontaneous emission. Stimulated emission can be produced when the process is continued and further generate light with the same phase, coherence and wavelength. The choice of the semiconductor material determines the wavelength of the emitted beam, which in today's laser diodes range from infra-red to the UV spectrum. Laser diodes are the most common type of lasers produced, with a wide range of uses that include fiber optic communications, barcode readers, laser pointers, CD/DVD/Blu-ray disc reading/recording, laser printing, laser scanning and light beam illumination. Laser printing is an electrostatic digital printing process. It produces high-quality text and graphics (and moderate-quality photographs) by repeatedly passing a laser beam back and forth over a negatively charged cylinder called a "drum" to define a differentially charged image. The drum then selectively collects electrically charged powdered ink (toner), and transfers the image to paper, which is then heated in order to permanently fuse the text, imagery, or both. As with digital photocopiers, laser printers employ a xerographic printing process. Laser printing differs from traditional xerography as implemented in analog photocopiers in that in the latter, the image is formed by reflecting light off an existing document onto the exposed drum. A laser rangefinder is a rangefinder that uses a laser beam to determine the distance to an object. The most common form of laser rangefinder operates on the time of flight principle by sending a laser pulse in a narrow beam towards the object and measuring the time taken by the pulse to be reflected off the target and returned to the sender. Due to the high speed of light, this technique is not appropriate for high precision sub-millimeter measurements, where triangulation and other techniques are often used. Lidar (, called LIDAR, LiDAR, and LADAR) is a surveying method that measures distance to a target by illuminating the target with pulsed laser light and measuring the reflected pulses with a sensor. Differences in laser return times and wavelengths can then be used to make digital 3-D representations of the target. The name lidar, now used as an acronym of light detection and ranging (sometimes light imaging, detection, and ranging), was originally a portmanteau of light and radar. Lidar sometimes is called 3D laser scanning, a special combination of a 3D scanning and laser scanning. It has terrestrial, airborne, and mobile applications. Spectroscopy is the study of the interaction between matter and electromagnetic radiation. Historically, spectroscopy originated through the study of visible light dispersed according to its wavelength, by a prism. Later the concept was expanded greatly to include any interaction with radiative energy as a function of its wavelength or frequency, predominantly in the electromagnetic spectrum, though matter waves and acoustic waves can also be considered forms of radiative energy; recently, with tremendous difficulty, even gravitational waves have been associated with a spectral signature in the context of LIGO and laser interferometry. Spectroscopic data are often represented by an emission spectrum, a plot of the response of interest as a function of wavelength or frequency.